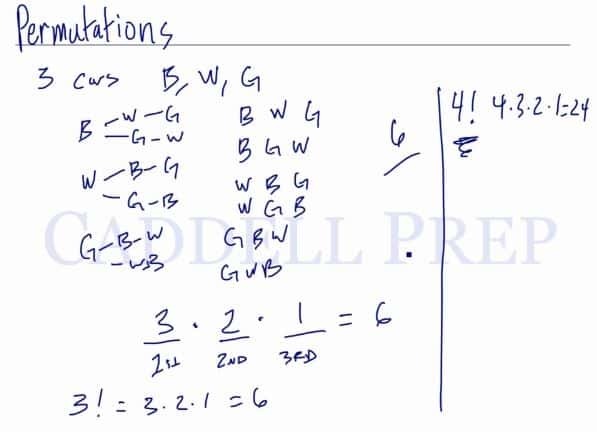 We will discuss permutations and combinations. In the first video, we are going to work with permutations. We have three cars, the blue car, the white car, and the green car. which adds up to the total number of order of 6 possibilities. In the first place, there can be three cars. In the second place, there can be only two cars since one car is already in the first place. At the third place, there can be only one car since there is only one left. Multiplying 3 by 2 by 1, we have 6. which is the same answer as above. We can simply use factorial, “!” to solve this kind of questions. If there are 5 cars, in how many ways can they finish for the first three cars? In this situation, we cannot directly use 5! because we are not finding the order for all five cars. Instead, we can apply multiplication up to the desired order, to which we call permutations. 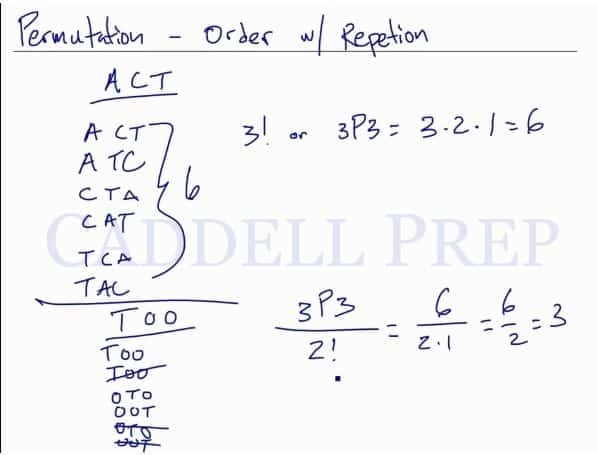 We use permutations in situations where the order and position matters. On a calculator, we can type in the first number, press MATH/PRB nPr, and enter the second number. The answer is the same in both situations. For example, there are three cars. A blue car, a white car, and a green car. We want to see how many different ways we can place them in different orders. There are different ways that these three cars can be placed. Another way to think about this is like having first place, second place, and third place. The number of cars that can go into first place is . But after one car is placed on the first spot, there are only two cars left. Then after the first two spots, only one car is left for the third place. If we’re going to count for all the places, we could use this thing called factorial. There are cars: A, B, C, D, and E in a race. a) How many can they finish, ? Since we’re going to count all five, we’re going to use five factorial. This is because five cars can go first. Then only four to go second and three will battle for the third place. Then only two will remain for the second place since three spots have already filled in. Two can be in second place and lastly, one will be in the fifth place. So, there are ways that these five cars can finish. b) How many can they finish, ? Here, we can’t do factorial because we won’t have the last or fifth place. Let’s just write four spots here which represents the first place, second place, third place, and fourth place. Doing this also gave us the same answer as the first one because the last one is inconsequential. It is inconsequential because, after the fourth place, there is only one car left. It wouldn’t change the number of outcomes. c) How many can they finish, ? Again, let’s draw first place, second place, and third place. d) How many can they finish, ? We’ll look into first place and second place. e) How many can they finish ? There are cars so all can possibly come in first place. Permutations are similar to factorials except we don’t finish the entire thing. If we have different numbers and want four outcomes, we’ll start with the total numbers we have then write the number of spots we’re going up to. This will multiply all the way down to spots. Now, let’s look at the actual permutation. This means we’ll start at and multiply the first numbers. We don’t stop at number , we stop at the fourth spot or number. In a calculator, we can just type this in. Go to Math then Probability then choose nPr which stands for a number, permutation, and a second number. This gives us the same answer. When do we use permutation? We use permutation if order or position matters. For example, if we have first place, second place, third place, and so on with distinct order, we use permutation. Or we pick people to be President, VP, Secretary, and Treasurer, we can also use permutation. Let’s say there are students running for the student council with available positions which are President, VP, and Treasurer. Let’s say we have another students to form a team of with no distinct position and order doesn’t matter, then we do not use permutation. Remember in a permutation, there is a distinct order or position that matters. In the second video, we are going to work with permutations with repeated elements. For the word KNEE, there are three distinctive letters with the letter E being repeated twice. If we were to reorganize the letters around to form another order, then we would also use factorial like in the last video. The only difference here is that since there is a repeated element, we need to divide the number of total outcomes by the repeated outcomes. We’ll have permutation with repetition. For example, the word ACT. Its letters A-C-T can be reordered in different ways. Here, there’s not much difference since there are two letter O’s. There are arrangements that are similar to another because of the same letter. So, you can’t just do factorial or permutation. Let’s look at another example and this will make a lot more sense. Let’s reorganize the letters in the word KNEE. normally divide by the factorial of the number of repeated items. In this video, we are going to work with combinations. 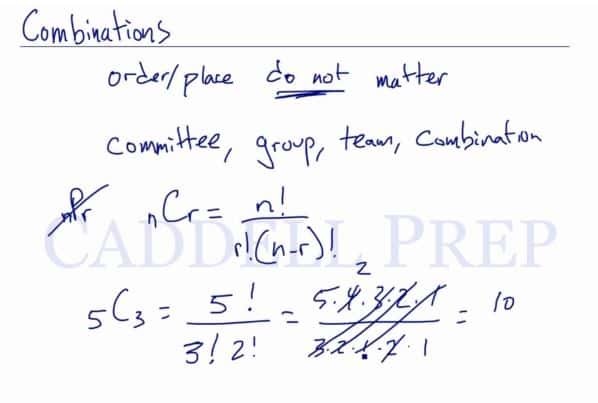 Combinations: Number of orderings where order doesn’t matter. We can use the formula: nCr to find the combination. We would have 5! on the top and 3! 2! on the bottom, which is similar to permutations with repeated elements. This may seem complicated but it’s really not that bad. We can also use the calculator here. There are students in a class. of them will be given class duties for the week. How many groups of can be formed? Here, the order doesn’t matter because there are no distinguishing factors among the students chosen. In this case, we’ll use the combination. This is much easier using a calculator. Next is we have students to be picked for class office – Pres., VP, Sec., Treasurer, and Judge. What’s important is that there are five distinct order or places. It’s not just a group of different people. It’s a people each one has a specific position. In this case, order matters. So, we’ll use permutation. There is a distinct difference between the combination and permutation.